This challenge seemed very unconventional to me so I decided to do something unconventional for SketchUp. SketchUp is a great program for 3D modeling but not so much for flat 2 dimensional images. For this challenge I decided to created a parody of a game I used to play as a kid called Wolfenstein 3D. It was a revolutionary game for the time and it basically launched the First Person Shooter genre video games. 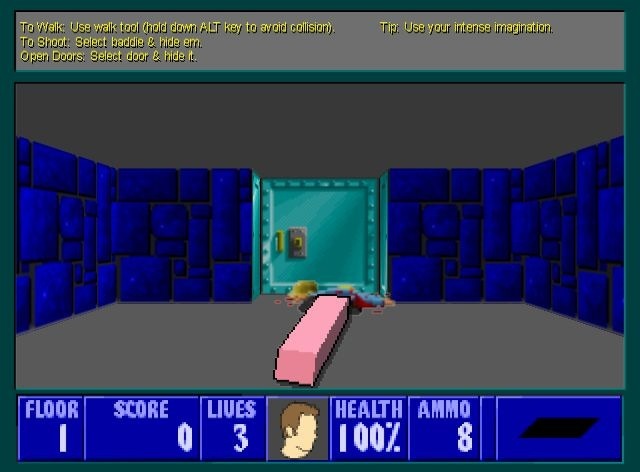 The game was only partially 3D and in fact, the only part of it that appeared to be 3D rendered were the walls. All of the bad guys, guns, game items and decorations were just 2D sprites arranged in 3D space. My parody version is called SketchUpenstein 3D and is modeled entirely in 2D components including the walls. The original enemy guards have been replaced with the “Unmodelers” who are bent on erasing all 3D models armed with giant SketchUp erasers. In this erase or be erased world you must guide the hero, Bryce, through the game killing, er, I mean, erasing the unmodelers before all is lost. Along the way you can recover some models taken from the 3D Warehouse including the coveted Google SketchUp 3D Challenge trophy. When ‘”playing” SketchUpenstein 3D be sure to use your imagination. Some laughable instructions are listed at the top of the screen to help you along.